Red Wheel ∕ Weiser Online Bookstore | The Deep Democracy of Open Forums by Arnold Mindell, Ph.D. Most of us are terrified of conflict, says Arnold Mindell, Ph. D., author of fifteen books and internationally recognized for his innovative synthesis of Jungian therapy, dreams, and bodywork. But we needn't be. His burning passion is to create groups and organizations where everyone looks forward to group processes instead of fearing them. 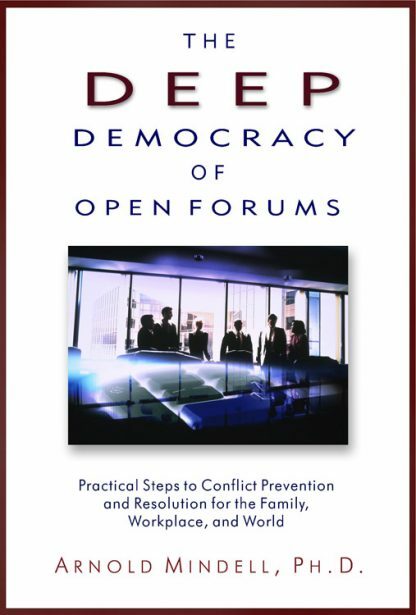 He calls this the deep democracy of open forums, where all voices, thoughts, and feelings are aired freely, especially the ones nobody wants to hear. Since 1992, one of Mindell's prime interests has been the bringing of deeper awareness to group conflicts. Conflict work without reference to altered states of consciousness is like a flu shot for someone in a manic or depressed state of consciousness. Most group and social problems cannot be well facilitated or resolved without access to the dreamlike and mystical atmosphere in the background. The key is becoming aware of it. Mindell introduces a new paradigm for working in groups, from 3 to 3,000, based on awareness of the flow of signals and events. You can take the subtlest of signals indicating the onset of emotions such as fear, anger, hopelessness, and other altered states, and use them to transform seemingly impossible problems into uplifting community experiences. As Mindell explains, "I share how everyone--people in schools and organizations, communities and governments--can use inner experiences, dreaming, and mysticism, in conjunction with real methods of conflict management, to produce lively, more sustainable, conscious communities."